Are Seaweed & Alkaline Foods Anti-Inflammatory? Can Gout Sufferers Eat Baked Beans? Does Eating Potatoes Give You Acne? Can Certain Foods Help Rosacea? A healthy diet won't cure psoriasis, but it could help minimize its symptoms, such as painful skin swelling and, if you have psoriatic arthritis, joint pain. Although research is lacking regarding whether nightshade vegetables contribute to the disease and their problematic effects remain controversial, according to the National Psoriasis Foundation, some people report feeling better by eliminating them from their diet. Before making significant dietary changes, seek guidance from your doctor. Naturopathic doctors such as Dr. Jeffrey Dach believe that nightshade vegetables, the family of plants that includes peppers, potatoes, tomatoes and eggplant, increase inflammation, triggering or worsening psoriasis. One theory is that nightshade vegetables are related to poison ivy, which isn't true, according to Barry Micallef, a plant biochemistry expert at the University of Guelph. Many alternative medicine practitioners also claim that the vegetables contain high levels of solanine, a toxic compound that provides natural protection from insects and increases inflammation in consumers. While potatoes can develop solanine, says Micallef, turning them green, if you avoid green areas of potatoes, you won't consume solanine. Although studies haven't confirmed adverse effects of nightshade vegetables on psoriasis, limited research reveals inflammatory potential. A study published in "Egyptian Society of Nuclear Sciences and Applications" in 2013, for example, showed that eating diseased potatoes, rich in solanine, increased markers of inflammation in older-age, postmenopausal albino mice. On his website, Jeffrey Dach, a natural medicine specialist, reports that one of his patients, a postmenopausal woman diagnosed with rheumatoid arthritis, was able to stop her hormone medications and remain free of joint pain by eliminating nightshades. Although Dach didn't address psoriatic arthritis specifically, he says he believes the vegetables increase inflammation and arthritis symptoms — which affect about 5 percent of people with psoriasis. The benefits of nightshade vegetables far outweigh any potential risks, says Pamela Piotrowski, a registered dietitian at the Arthritis Society of Ontario. Avoiding them could take a toll on your wellness, particularly if you don't replace them with equally nutritious alternatives. 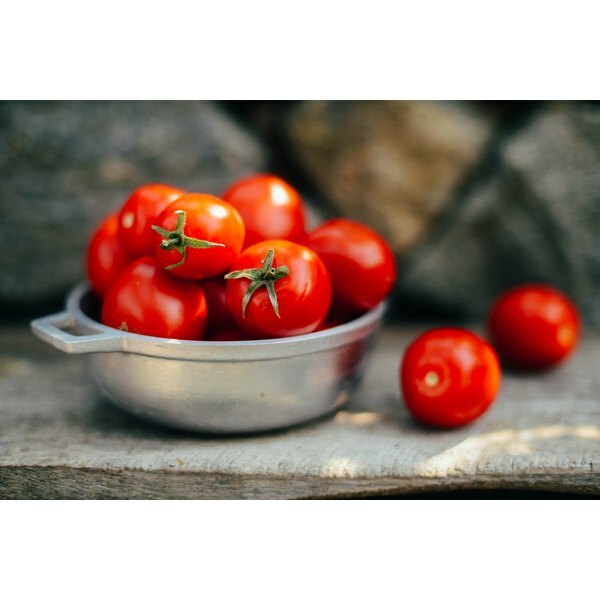 Tomato products are prime sources of vitamin A, a nutrient that helps keep your skin healthy. Tomatoes and potatoes also supply valuable amounts of vitamin C, an antioxidant that guards against inflammation and supports your body's ability to fight infections and disease. As low-calorie foods, peppers and eggplant can be useful components of a weight-control-friendly diet; reaching and maintaining a healthy weight is important because excess pounds increase your risk for psoriasis. If nightshade vegetables seem to contribute to your symptoms, discuss ways to healthfully replace them with alternative foods with your doctor or dietitian. To lower inflammation through other dietary steps, shift to a heart-healthy diet that emphasizes anti-inflammatory foods, such as fruits, vegetables, whole grains and fish. The American Heart Association recommends eating oily fish, such as salmon, mackerel or herring, at least twice per week for omega-3s — healthy fats that lower inflammation and your risk for heart disease; psoriasis and psoriatic arthritis increase your risk for cardiovascular disease. Limit or avoid sugary foods, such as candy, soft drinks and pastries, fatty meats and dairy products, which can increase inflammation. National Psoriasis Foundation: Psoriasis and Diet: Is There a Connection? Can Eating Too Much Fruit Cause Gout?